This passage sets the stage for Mark, and is important for understanding not only the Gospel but our own Christian lives. 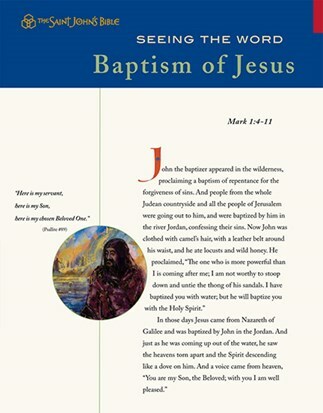 In Baptism of Jesus, we are called to reflect on both the beginning of Jesus' mission and the role of John the Baptist, who features prominently in the illumination. Many who have seen The Saint John's Bible firsthand are left with the desire to share their spiritual experience with friends, family, and members of their faith community. To create that opportunity, Saint John's School of Theology•Seminary and Liturgical Press are pleased to offer Seeing the Word. This new program seeks to ignite imaginations of all ages and help deepen the faith of Christians through reflection on Sacred Scripture in both the written form and the powerful imagery of The Saint John's Bible. Designed for small groups led by a designated facilitator, Seeing the Word offers reflection guides that focus on the illuminated Word. Each full-color guide includes a beautiful illumination from The Saint John's Bible along with corresponding Scripture text, exegesis, and artistic commentary. These pieces also lay out the spiritual prayer process of lectio divina and provide a space for individuals to journal their personal thoughts and reflections along the way.